All of us were excited, except my mother, who looked worried. Father knew this very well and under different circumstances he would immediately rush to buy plates and other utensils, and possibly a saree for Maa, but buying a 21-inch colour television specifically for the world cup meant that he had to be more calculative than usual. Yet, after a few minutes, I was made to rush to market to buy groceries and disposable plates. Half an hour before the toss, the house was bustling with activity, I made a rough calculation, more than thirty-two people had shown up, well above father’s estimation, but knowing Maa, I am sure she had accounted for the extra people. The young ones like me were fortunate enough to sit closest to the action, and for once were not being reprimanded about sitting too close to the TV, the adults sat directly behind us, the elderly ones were given access to the sofa and chairs out of courtesy, my father, while not the oldest by any stretch, occupied a sofa by virtue of being the host and the master of the house. The womenfolk drifted in and out of the room, speaking in hushed tones so that the cricket experts on TV and outside of TV were not interrupted. By the time the match started, the number of visitors had increased. There was barely any room for us to move, I had correctly predicted that going to the toilet would prove to be a difficult chore, so had finished my deed just before the first ball was bowled, and for the rest of the match, had decided to minimize water intake. Maa kept the pakodas coming and the tea flowing and the other women chipped in, there must have been forty people inside our moderately sized living room and twenty outside it. Only us children and a handful of unrealistic adults gave India a chance, we were facing the mighty West Indies at their peak, the best bowling unit of all time, and Sunil Gavaskar and Kapil Dev, though worshipped back home, were yet to be fully regarded as gods. The cracks on our fragile hopes started appearing early, the West Indian pace quartet ripped through India’s batting order as they were largely expected to do, the tail-enders however put up some fight, India ended up with an almost respectable 183. The sun had begun setting and as much as we wanted to be hopeful, it was difficult. One of us kids wondered aloud if we should just go out and play some cricket while we still could instead of watching a match whose results were already a foregone conclusion, the rest of us who hadn’t queued in front of the loo, shushed him. The second innings began, and within minutes, that legend of a man, Gordon Greenidge was out- bowled. We started shouting and screaming in unison, and a few aunties somehow made their way inside the room, curious if we were happy or sad.In spite of all the difficulties, the pakodas, sweets, and chai managed to go from hand to hand until they reached their intended recipient. No one was listening to the commentators any more, all of us gave our own take on the game, and for a while we thought that there was a chance, a chance for us to win the game. And then came Isaac Vivian Alexander Richards - chewing gum, looking menacing without trying, and treating the bowlers and fielders with equal disdain. Boundaries flowed and once again the mood of the room turned glum. And then it happened - Desmond Haynes fell and King Richards departed soon after, Clive Lloyd didn’t stick around for too long either, and we sensed that slowly but steadily, the tide was turning, India was back in the game. Dujon finally fell after a gritty inning, and then the end was quick. India had managed to do the unthinkable, the world cup was ours. We celebrated as much as the Indian players on screen, irrespective of the age, all of us jumped, shouted and sang, there were some fireworks outside, and a lot of us went out into the streets to celebrate. 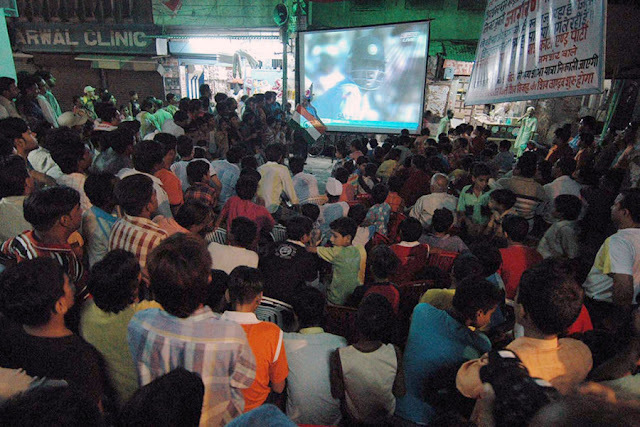 People were calling on the landline to confirm that India had indeed won. All of us were rejoicing well into midnight. On 25th June, 1983, close to four decades after our Independence, India had well and truly arrived in the global scene. I still remember that night vividly, every moment from the match firmly etched into my memory, of course, it was India’s first world cup victory, how could anyone who saw the match that day ever forget it. 36 years on, it’s inevitable that my memories from that June night resurface. It’s 2019, India is playing the world cup finals once again, and we aren’t the underdogs this time, in fact, we are on the verge of winning the match. The living room in which I am sitting and enjoying what is left of the game is comparable in size to my living room from my childhood years. But it’s just me here. My wife isn’t interested in cricket and has gone off to sleep, my son is watching the match on his iPad in his room. For some reason, I think of my friends who were in the room with me that night, I struggle to remember their names. And I wonder what they are doing now. Work of fiction. Image from here.